In honor of Veterans Day I wanted to re-post one of my earlier articles. It has been one of my most read posts and the prayer still gets viewed. *Remember to tell a Veteran “thank you for serving our country” today. You and I have the freedoms we do because those Veterans served before or are serving today and tomorrow. My wife and I offer our thanks to you Vets and appreciate your service and sacrifice. God bless you. This Friday prayer reminder I thought I would let a veteran speak to us. Even though Lacy has gone on to be with the Lord his words still speak strongly. I found this on this story and prayer back in April and I hope I have give proper credit to www.jdwetterling.com because I found this on his site. Remember to thank a veteran this weekend for their sacrificial service to our country. Remember to pray for a veteran and his family too. Take time to go watch a Memorial Day parade out of respect to the veterans who have died in service to their country. You can go back and read any of the four previous Pray for Veterans posts for an idea of how to pray. I hope you and your family and friends have a good Memorial Day weekend. I also hope the words of this testimony and prayer bless you and encourage you like they did for me. Lacy Veach was my friend and roommate in a tiny trailer on skids parked among lots of trailers on the beach of the South China Sea at Tuy Hoa Airbase, South Vietnam, in 1968-69. He died October 3, 1995, when cancer attacked his brilliant mind. Lacy did it all in his short life. He was a USAF Academy graduate, F-100 pilot, Misty FAC (the bravest of the brave), F-105 Wild Weasel pilot (just brave), solo pilot with the USAF Thunderbirds, astronaut, husband, father and born again child of God. I flew top cover for his rescue when he was shot down over the Ho Chi Minh trail in Laos. On October 22, 1992 I watched him blast into space aboard the Columbia (STS 52) on a clear Florida day from my backyard in Tampa. His voice coming over my TV as he rode that rocket into the wild blue was a couple octaves lower than it was the day he hung from his parachute atop a tall tree in Laos, calling for help. If Lacy knew the Lord back then he kept it a secret from me (he probably thought the same about my faith), but his dying prayer below removes all doubt in my mind. Every fighter pilot considers himself the world’s greatest fighter pilot, but I’ll confess now, 35 years later, that Lacy was a better “stick” than I. A few weeks before he succumbed to cancer he wrote the following prayer with the help of Kathleen Golgin Ph.D. At his request, his space shuttle commander and good friend, Astronaut Mike Coats, read it at his funeral. His ashes were dropped from a plane over home state of Hawaii. My friend for eternity, Lacy Veach, speaks for me from heaven this Veterans Day, 2004. May God continue to have mercy on America. My education began early in life. I studied the ancient civilizations and learned of modern politics. Mankind’s history, I discovered, swelled and ebbed with the seemingly perpetual tides of war. Military campaigns and strategies, past and present, were made familiar to me, as were expert soldiers who fought for justice and those who did not. Here for all time was the clear and unromanticized reality of war. To fight in the defense of freedom, in the defense of justice, in defense of eternal principals of morality transcendentally ordained. To fight against oppression and wickedness. To fight what Milton would call, “The Adversary of God and Man.” For these reasons I am a warrior, Lord. It was to establish justice and forge freedom that I was once locked in a battle to survive, to survive in a sky thundering with gunfire and clouded by the smoke of exploding rockets. Lord, in those moments, I knew what it was to implore Your protection….to be shielded by Your mercy. I am an old warrior now, Lord, and, as the saying goes, perhaps “a wiser one.” And, I now know of a war waged between Time and Eternity. A war, which if lost makes empty the victory of all others. A war which, if finally fought and won, would make all other wars unnecessary, indeed, impossible. In this siege I need no spears or scimitars, no ballistics or gunners. Let my warrior’s life begin with end. Lord, I pray when You crack the sky, that You will find me….find me faithful. I AM A WARRIOR, LORD. NO….I AM YOUR WARRIOR, LORD. I thought I would let two veterans, one alive and one deceased, speak to us today about veterans and Memorial Day. I found this information on www.jdwetterling.com and I retyped it to fit this format. Even though I have never met J.D. I want to thank him for his site and work. I hope you get to make it to a Memorial Day Parade to show respect to the veterans who march and to the veterans who died in service to their country.I also want to encourage you to thank a veteran this weekend for their service to our country. I also want to encourage you to pray for a veteran and their family also. You can read one of the past four Friday posts, “Pray for Veterans” to get an idea of what to pray. Twenty-four hours a day, seven days a week and every week of the year a soldier guards the Tomb of the Unknown Soldier in Washington D. C. This action is part of the respect paid to fallen military veterans. I visited that site as boy with my family. We watched the guard at his post and we watched the changing of the guard. It is quite a moving ceremony. This Friday I want to share something about this ceremony. My dedication to this sacred duty is total and wholehearted. In the responsibility bestowed on me never will I falter. And with dignity and perseverance my standard will remain perfection. Through the years of diligence and praise and the discomfort of the elements, I will walk my tour in humble reverence to the best of my ability. It is he who commands the respect I protect, his bravery that made us so proud. Surrounded by well meaning crowds by day alone in thoughtful peace of night, this soldier will in honored glory rest under my eternal vigilance. 1. Their protection, spiritually, emotionally and physically. 2. Their family’s protection and for God’s provision in their lives. 3. Many to come to a saving knowledge of Jesus Christ. 4. The many godly chaplains to do their ministry in the power of the Holy Spirit. 5. The families that have had loved ones die to experience God’s comfort, mercy and presence as they grieve (2 Corinthians 1:3). 6. The general public to appreciate what these men and women do to serve their country. 7. The healing of broken bodies and emotions because of what they have gone through. 8. That no matter what the circumstances they have experienced, they would turn to God and not away from Him. 9. However else God may lead you to intercede for someone. Thank you for praying. Your prayers make a difference and they are important. Someone may not know you are praying for them down here, but Almighty God knows you are praying. God responds to His people’s prayers. Stay faithful and hopeful! – Daily Strength for the Battle, p.12. If I Knew Then by Brian Willis, p. 59. 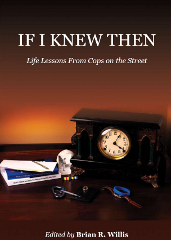 Just posted a review of If I Knew Then, Life Lessons From Cops on the Street edited by Brian Willis. Go to the book review page to find and read the review. If you know someone in law enforcement or you are a pastor I highly recommend this book. It is filled with real life stories that will move you to a greater appreciation of the people who serve in law enforcement. These are two of my favorite pieces of clothing. I used to wear them when I went to karate classes. One of them was a gift from my youngest son. I used to like studying and practicing martial arts. I am a little rusty now and not as practiced as I used to be. I like the combat arts the best. Some of you know what I’m talking about, the real stuff. You see, for me there is a difference between martial arts and martial sciences. 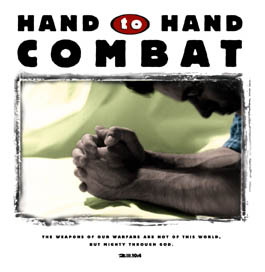 To me there is a big difference between sport karate and functional hand to hand combat. Spiritually there is a difference between asking God for something for ourselves and interceding with God for someone else. To me intercessory prayer is one of the most unselfish ministries we can be involved in. You see, real disciples learn to be unselfish. When I was a little younger there were times I would get antsy. I needed a good workout, a good fight. My wife would tell me to “go fight with Bryan. You need to fight.” I love my wife; she knows when I need a good fight. As for Bryan, he was my sensei and friend. At times he would call me “the fighting pastor.” I can’t beat him and he sure knows how to fight. I have to admit, I miss fighting with him and working out with him. He hit me so hard one time; I literally saw stars, little silver things shooting in at me from all directions! Man, I miss working out with him. I can’t go back there, but I can still get a good fight – on my knees in prayer! But that brings me to this. Those martial arts workouts were just physical and fun. There were rules for each participant’s safety and development. In spiritual warfare our enemy doesn’t play by the rules. But there are Kingdom rules that can defeat him. Almighty God wants you and me to grow spiritually and develop as prayer warriors. People and churches need us to do battle in prayer. Intercessory prayer is spiritual and necessary. People are dying and going to hell. Sinful lifestyles are destroying lives and families. Many churches have quit looking for the return of the Lord and have quit sharing the Gospel and making disciples. Prayer is the first work. Prayer is the important work. The work of the devil, our sworn enemy is to keep us from praying. Will you take up the challenge and develop into a prayer warrior? Will you make the time or take the time from your 24 hours to become a prayer warrior? God the Holy Spirit will empower you (Romans 8:26); God the Son will intercede for you (Hebrews 7:25); God the Father will answer you (Jeremiah 33:3). With all that help and the Word of God as your manual how can you lose? You will be victorious and more than a conqueror! To God be the glory! There will be more to come on prayer. Stay faithful and hopeful! Keep fighting the good fight! (3)For though we live in the world, we do not wage war as the world does. (4)The weapons we fight with are not the weapons of the world. On the contrary, they have divine power to demolish strongholds. (5)We demolish arguments and every pretension that sets itself up against the knowledge of God, and we take captive every thought to make it obedient to Christ.